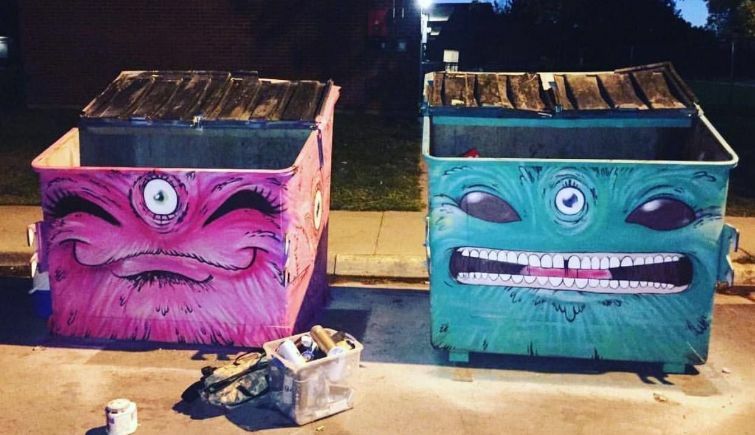 Description: Birdseed Collective along with experienced Lead Artist/Executive Director Anthony J. Garcia Sr. will enlist at least 20 talented artists to design and hand paint 61 Denver Solid Waste dumpsters in the Quigg Newton Housing Development area. These dumpsters are “public space” as they are situated on the local residential streets directly in front of residents’ front doors. This artwork will transform the vision and climate of the community through emotion and color. The project will be planned around a community celebration. Neighborhood residents will be invited to participate during the process so that all the community is vested artwork. Stakeholders include: Denver Housing Authority Quigg Newton Leadership Resident Council, Sunnyside community members, Denver Housing Authority headquarters, Sunnyside Neighborhood Association, Denver Police Department District 1, Denver Solid Waste and Councilman Rafael Espinosa. Description: Literary Hide and Seek will use water-activated paint to hide short excerpts of Neal Cassady's prose in different parts of the park, and provide clues to the public on how to find the prose on Facebook and community message boards. This will draw visitors to the park to find all sorts of surprising little experiences that make them want to linger. Neal Cassady is a hugely important international literary figure who grew up in Denver and went to East High School, but currently has no real tribute in Denver. City Park currently has literary elements such as the Shakespeare Elm and the Robert Burns statue, and adding a third literary element will add to a more complete literary placemaking scheme. Description: During the summer months, Civic Center Park’s gardens are renowned for horticultural beauty and artistry. Unfortunately, the flowers are removed each fall, and the beds remain bare patches of dirt until the following spring. The Art in Beds project aims to improve Civic Center’s winter aesthetics by installing art in the Civic Center Park flower beds during their dormant time. Working with Denver-based artist, Nick Geurts, and his interactive public art firm, Yetiweurks, as well as Denver Parks and Recreation and Denver Arts & Venues, Art in Beds will bring the interactive sculptural piece “Tree of Transformation” to life in one the central planting beds of Civic Center Park. Sites: Eight locations along the 1st Avenue corridor between Federal and Sheridan boulevards. Description: 1st Avenue is a critical corridor for pedestrians, cars, bicycles and buses and creates "downtown Barnum" at Knox court. The Barnum Piñata Parade will be a "circus parade" of papel picado "circus banners" and eight lightweight circus animal piñatas that "march" down 1st Avenue light poles. The project partners an experienced public artist and papel picado designer, Tracy Weil, with piñata builders, Jesus and Ana Reyes. The papel picados and piñatas will be designed alongside Barnum Elementary art classes and decorated by the artists and neighborhood volunteers. At the end of the summer installation, the project will be celebrated by "breaking" piñatas at the annual Barnum block party. The concept honors the Hispanic community, while celebrating the little-known "circus" history that belongs to all Barnum residents. While Barnum is a well-established, family-centric community, it is facing rapid gentrification and new residents arrive every day. In addition to celebrating existing families, the installation encourages residents (old and new) to visit and patronize the many locally-owned businesses along the corridor. Description: The mural collaborative is a two-tier art project which will allow a cross-community coalition between two of Denver's neighborhoods most affected by gangs, violence, and drugs: Southwest Denver (Westwood) and Far Northeast Denver (Montbello). In both neighborhoods, murals and/or mural panels will be constructed, painted by community members in concert with local artists, and placed temporarily in public places, parks, and/or schools. Neighborhood groups will give presentations focusing on public safety to ensure that the community is aware of "safe havens" such as fire departments, police departments and safe houses in the area. Groups will facilitate discussions with the community and youth in the area promoting positive choice-making and violence prevention. In addition to this, GRASP, which is focusing on Southwest Denver, and it's partner FAVA, which is based in Far Northeast Denver, will collaborate to complete four cross-community meetings to connect the two neighborhoods. Sites: Five Points plaza, the space between Blair Caldwell Library and Sonny Lawson Park, the light-rail station at 25th and Welton, and other places of local significance within the Five Points neighborhood. Description: “Moveable Feast” is a five-month, community-wide project occurring May-September 2017 in Five Points. Each month during the project period, artists will work with members of the Five Points community to create uniquely designed tables placed in public sites throughout the neighborhood. Once completed, the tables would remain on display for the duration of the project and possibly longer. The completion of each table would be celebrated with a community gathering and meal with guests including neighborhood residents, individuals experiencing homelessness, and those who work nearby. The monthly gatherings would begin at the previous month’s site and include a procession to the new site, helping to link the various areas of the neighborhood and drawing additional people to join the celebration. Healthy food will be provided by organizers, and through donations from local restaurants and businesses. Bringing people together for a meal will inspire conversation between the disconnected groups that comprise the Five Points neighborhood. Description: The Santa Fe B.I.D. is guiding the community to create a people-centric neighborhood with connectivity and improved safety along Santa Fe Drive. The project is strongly rooted in the historical, cultural and ecological history of the Santa Fe Arts District and reflects neighborhood growth now and into the future. The first part of the project will be two community interactive visioning workshops. Workshops will serve to establish the parameters and guidelines for the visual theme for two Santa Fe Drive intersctions. The app Streetwyze will be used to integrated data collection. Then the guidelines established and data collected will be used to create an artist competition to design and install painted crosswalks and other street fixtures suce as sidewalks, benches, bollards, lights, trash/recycle containers, rain barrels and buildings. This art will become a three dimensional expression of the area's natural, cultural and artistic heritage. Finally, selected artists and team collaborators will host participatory events concurrent with installations. 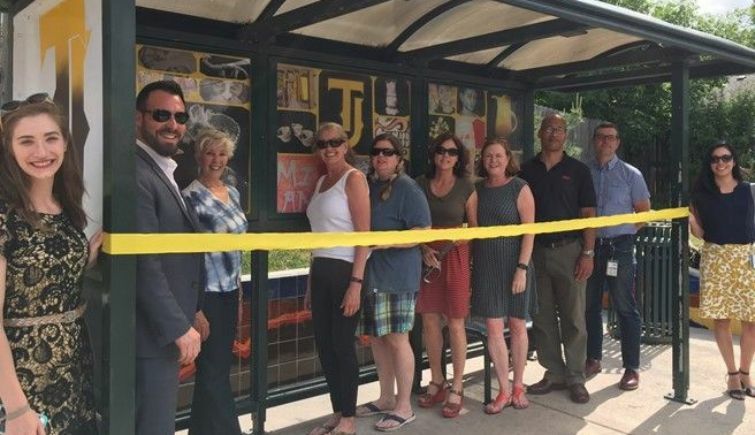 Description: A bus shelter will combine function and art, acting as a blank canvas to display work created by the students of Thomas Jefferson High School (TJHS) art club. Supporting place-making, the display of student art will connect the community more closely with the school and give commuters and pedestrians an appreciation of the artistic creativity and talent of the students at TJHS. The existing bench will be relocated from the eastbound bus stop to the westbound side of Hampden. Art students will paint the bench. This project provides an aesthetically pleasing experience for the surrounding community and increases safety and comfort for commuters along a major transit corridor. Site: Along Lakewood Gulch, between Federal and Sheridan boulevards, both north and south of the W Light Rail Train line. Description: This installation utilizes wind chimes placed in a strategic sequence throughout the Lakewood Gulch to celebrate the kinetic energy created there. The installation will comprise of up to 50 chime structures, placed at regular intervals of 20 to 50 feet, in groups of 4-5, along the span of the Lakewood Gulch stretching from Federal Boulevard to Sheridan Boulevard, on both the north and south sides of the RTD Light Rail line. Kinetic energy from the Light Rail train, bikers, or wind will ring the chimes. As patrons of the Gulch pass through the installation, they will hear different pitches in succession (melody) or together (chords). Neighborhood artists and children will decorate the wind chime structures, and neighborhood-based musicians will compose pitch progressions.